STACKABLE REUSABLE MEAL PREP CONTAINERS INCLUDED: 12 leak resistant, BPA free, microwave safe, dishwasher safe, freezable, stackable and recyclable food containers are included! 4 sizes for your personal dietary needs (6) 16oz, (2) 12oz, (2) 28oz, and (2) 38 oz. The 6 Meal ISOBAG® will fit up to 6 -38oz. containers or 8 or more -28oz or smaller containers for perfect portion control. Additional black and color containers available for purchase for around $2 a piece making, food prep a breeze! 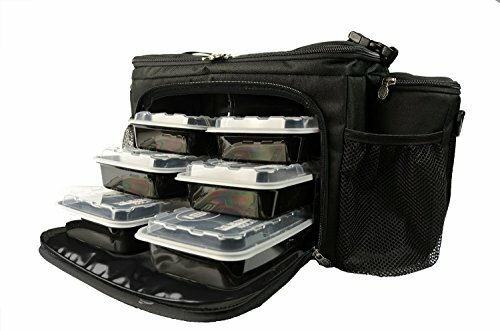 IDEAL FOR PEOPLE LEADING BUSY, HEALTH CONSCIOUS LIVES Healthy eating on-the-go can be expensive and hard to do when not preparing your own meals. It can also be cumbersome without an organized system, not to mention costly if the bag you do use is of inferior quality and the food spoils. Investing in a high quality food management bag is imperative. There are many lunch boxes for adults available but none match our quality and attention to detail. Invest in yourself and buy the BEST...ISOBAG®! !